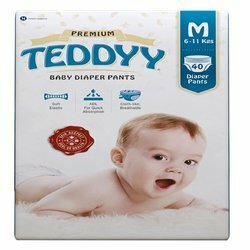 We are a leading Manufacturer of teddyy baby diaper pants - premium, teddyy premium baby diapers, teddyy super baby diapers, teddyy easy baby diapers, teddyy easy baby diaper pants and baby pull ups diapers from Nashik, India. Teddyy offers a world class pants style diaper for the baby’s comfort and freedom. Customised for the Indian weather, designed for the Indian body-type and made in India, Teddyy Diaper Pants Premium are extremely soft and breathable. Using SAP (Super Absorbent Powder) which converts liquid into gel, Teddyy Premium Baby Diaper Pants offer a superior performance along with a unique embossed design which increases absorbency and a soft, cottony waist band for added comfort. Embossed Cloth-like breathable non-woven topsheet. ADL - For quick and uniform dispersion. 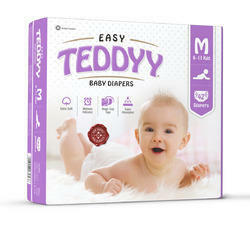 Teddyy offers a world-class quality diaper for babies. They have been uniquely designed for the Indian body-type and weather and are made in India, with unique features to help babies stay free and active! With a 3D core containing SAP (Super Absorbent Powder), Teddyys have an optimum absorption capacity with a highly comfortable, soft and snug fit; all to ensure that your baby’s skin remains untouched and natural. Reseal-able side tabs facilitate repetitive adjustments. Waist elastic for better fitment. Hydrophilic non-woven top sheets for fast absorption. Decorative "No Tear" frontal tapes for easy fastening. Nobel Hygiene is India's No 1 Manufacturer of Adult and Baby diapers. Teddyy Super Baby Diapershave been thoughtfully designed, with unique comfort features to enable babies sleep peacefully. This keeps them happy and active throughout the day. Small - Suitable for babies 3 - 8 kg. Medium - Suitable for babies 6 - 11 kg. Extra Large - Suitable for babies 13kg & above. They are available in pack of Small 60pcs, Medium 54pcs, Large 48pcs & Extra Large 42pcs. 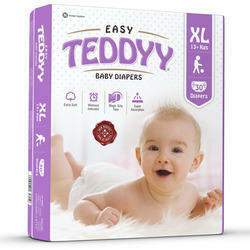 Teddyy Easy Baby Diapers manufactured by Nobel Hygiene, (Baby Diapers Manufacturer) . These diapers ensure better breathability and comfort by making use of its anti-bacterial absorbent core, re-sealable side tabs and wetness indicator. Provides Greater comfort with Great affordability. Resealable side tabs facilitates repeatative adjustments. Decorative "No Tear" frontal tapes for easy fastening . Standing Leg Guards to prevent any side leakage. Teddyy Easy Baby Diaper Pants offers a world class pants diaper designed for delivering the maximum product quality at a competitive price. Customised for the Indian weather, designed for the Indian body-type and made in India, Teddyy Diaper Pants Easy are very soft and breathable. 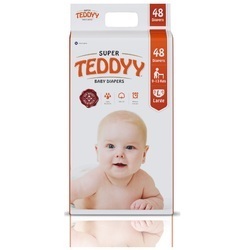 Using SAP (Super Absorbent Powder) which converts liquid into gel, Teddyy diaper pants offer a great fit and excellent performance. ADL for superior liquid distribution and absorption. Soft, cottony waist band for extra comfort. Nobel Hygiene is India’s No 1 Manufacturer of Adult and Baby diapers. Teddyy Baby Pull ups Diapers offers the world class quality pant style diapers for babies, they have been thoughtfully designed, with unique comfort features to enable babies sleep peacefully. Also keeps them happy and active throughout the day. They are carefully shaped for the best fit and comfort, offering freedom of movement with high absorption capacity. Small – Suitable for babies 3 – 8 kg. Medium – Suitable for babies 6 – 11 kg. Extra Large – Suitable for babies 13kg & above. They are available in pack of 44's & 60's for Small, 40's & 56's for Medium, 34's & 48's for Large, 32's & 46's for X' large. Teddyy Disposable Baby Diapers offers the world class quality diapers for babies, they have been thoughtfully designed, with unique comfort features to enable babies sleep peacefully. This keeps them happy and active throughout the day. With a 3D core containing SAP(Super Absorbent Polymer) to prevent bacterial growth and keep baby skin dry. They are carefully shaped for the best fit and comfort, offering freedom of movement with optimum absorption capacity. Hook & Loop magic grip tape. They are available in pack of 2's, 5's, 10's for all sizes 48 for Small, 42 for Medium, 36for Large & 30 for X' large. Teddyy offers a world class Pants diaper for your baby’s comfort and freedom. Customised for the Indian weather, designed for the Indian body-type and made in India, Teddyy Diaper Pants Premium are extremely soft and breathable. 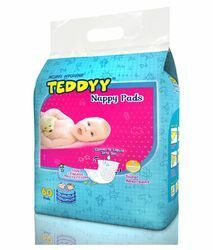 Using SAP (Super Absorbent Powder) which converts liquid into gel, Teddyys offer a superior performance along with a unique embossed design which increases absorbency and a soft, cottony waist band for added comfort. Teddyy Kids Diapers offers the world class quality pant style diapers for babies, they have been thoughtfully designed, with unique comfort features to enable babies sleep peacefully. Also keeps them happy and active throughout the day. They are carefully shaped for the best fit and comfort, offering freedom of movement with high absorption capacity. They are available in pack of 44's & 60's for Small, 40's & 56's for Medium, 34's & 48's for Large, 32's & 46's for X 'large. 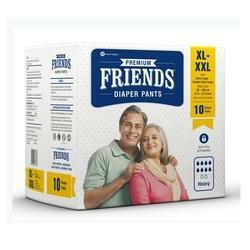 Friends has made a mark as a quality brand and enjoys a high customer loyalty by offering range of unique features. Millions of senior citizens have embraced an active lifestyle with dignity after using Friends. Doctors recommend adult diapers for patients with prostate disorders, piles, incontinence, urology problems, and diabetics. It is also used by patients who are paralyzed, bedridden or disabled. 8 hours of snug fit protection and super absorbency. Non-woven one-way top-channel fluid into the absorbent pad & prevents it from flowing back. Frontals tape with landing guide.